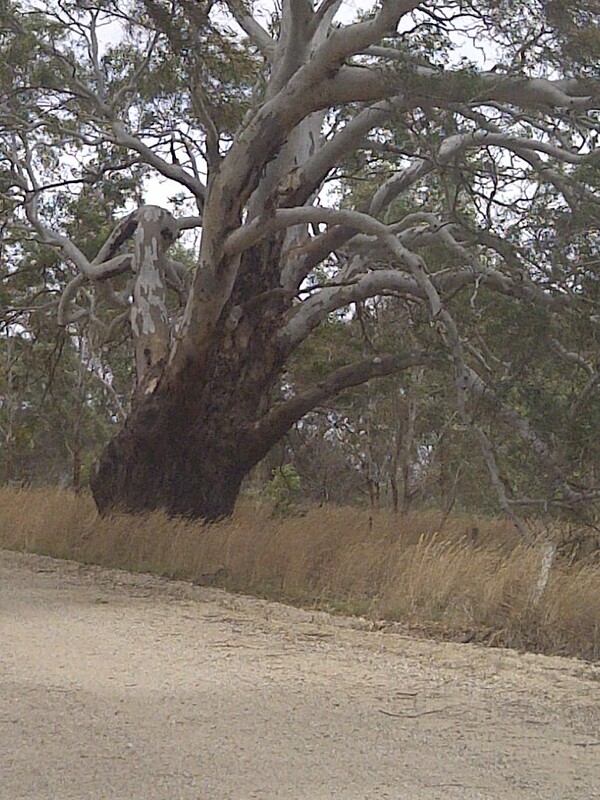 I look in awe at the majestic trees that grow in the Aussie bushland. The gum or eucalyptus trees smell fabulous too. I was told a lemony smelling tree was actually useful to ward off insects. The flora and fauna of Australia is gorgeous. Besides seeing koalas in the wild or waking up to see kangaroos, I can also appreciate kangaroo paws – a wild flower or bush plant. The trunks of trees and the way it grew are awesome. Huge and almost reminding me of some fairy tale movie where you would expect a witch to jump out. You have to see it to believe the towering trees and how minute I was standing at the foot of the tree! It has been an eventful week of health matters for A, B & me! A was rushing about hunting me down but just could not grab me by the neck! What to do….since I have loads of work meetings and besides I was feeling poorly too! By the time A got hold of me, he had jumped into his car to the general practitioner. He had a sudden bout of tearing that could not stop! A’s personal assistant made no sense as she told me A needed an ENT! I told her “no” just tell your boss to go and see Dr Billy Tan. I know Dr Billy Tan to be a really good doctor, not a fuddy duddy one but a fantastic opthalmic surgeon! Dr Billy Tan is somewhat cool and keeps a mean collection of antique cars! A saw Dr Tan and it was an interesting description on how Dr Tan appeared to him – like a construction worker! I laughed. Still A was very happy and pleased with how deftly Dr Billy Tan arrested the “leaking eye”. A said he was suffering so much as apparently an eye lid hair lodged self into the duct and needed an immediate extraction. I was happy nothing untoward happened to A. As for B, the story is not as nice but instead sad. B Whats App a text to ask if I would be in the office first thing in the morning. I said I would be and B showed up in the boondocks of my office at 6.30am. I had meetings starting at 8am. B told me of a minor surgical procedure which led to the discovery of a rare form of cancer in the appendix. Biopsy showed it was sadly cancer, stage 3. I can see the visibly shattered B and asking me who can be her doctor. I had asked for B to remove a cyst but along the way, cancer was discovered. I was stunned. B is a young person, not beyond 35 years old. I was glad B took my surgeon friend as he was an expert and spotted the tumor whilst he was moving to the operation site. I dashed about getting B second opinions from two sets of doctors; medical oncologist and a general surgeon who does a fair bit of surgical procedures to remove cancerous tumors. I feel for B and hope all goes well in the decision making process for onco surgeon and onco doctor. As for myself, my nose bleeds have gotten worst and it is quite a scary sight for my colleagues to see me bleeding from the nose when it is not even Halloween yet! I will continue to lend support and help B as much as I can. I can only help B make sense of chemotherapy post surgery and guide B on questions to ask. I wonder why I am always in the position for many to hunt me down for doctor recommendations? Whilst writing this blog, C called asking for a good cardiologist! I suppose I found my purpose in life…. I attain perfect or near perfect scores in most subjects and this includes achieving perfect or near perfect ZEROs for the subjects of Math & Chinese during my 4th year of formal schooling. Actually I lie , I had an average of 30 t0 40 marks out of a 100 for math most times and less than 10 marks out of a hundred for the Chinese Language! This is quite a feat I tell you and my teachers used to throw their arms up in the air in despair as how can I who is near perfect for English, Bahasa Melayu, history, science and other subjects. It is not my fault as I have a solid background in an English speaking community. I speak English at home too and everywhere I went, English was my forte! This had to change as PSLE came around soon and my parents did not like the red marks appearing on my report book. Frankly, I did not like the color red either. My mum found me a Chinese Tutor and for 2 years this fantastic Mrs Chan taught me Chinese like no other teacher. I was forced to memorize idioms, read Ba Jing and Chinese Classics. With classes on a 1-1 basis on an hourly basis, I did well as I improved. It is was through Mrs Chan that I did well for Chinese for PSLE and went on to take A Level Chinese. But, I just did not speak Mandarin well and I can understand as I could find no opportunity to practice this unless I was at tuition class. As for Math, I struggled through school with it and when I left for university study to read my Bachelors at the University of Oregon (UO), my nightmare began. I had to take a series of calculus classes – 3 terms of it actually and I had to overcome this in order to complete a core module for my Economics degree. I went off to remedial class as I was achieving “A” grades in term courses and did not want this series of 3 classes to pull my grade point average (GPA) down from 4.0 to 3.0! GPA was important to me as I wanted to ensure I stayed on the Deans List of Students! As luck would have it, I had the most difficult Professor who offered the course that term. Prof Sherman! Nemesis of most undergraduates who loathe Math! Prof Sherman cackles and is a stern man. He had no time for “imbeciles” in Math and he made it known. I did well in remedial Math to establish a foundation and made good friendship with Mark Womack, a Graduate Teaching Fellow (GTF) doing his PhD in Mathematics. Mark patiently held office hours for me 3 times a week and I plodded off to his room for lessons. Prof Sherman did not turn out to be as tough. I too, went to Prof Sherman and explained my phobia for Math. Surprisingly Prof Sherman softened down and offered me office hours to see him twice a week. Each week I went off to see Prof Sherman and he taught me calculus. Sine, Co Sine, tangents, derivatives of this or that etc. Logs and financial calculators became the norm in my classes for the consecutive 3 terms. I managed to pass with B+ grades and am pleased to stay I managed to stay on the Deans List . Math may have been tough but my doggedness and tenacity overcame these two nemeses! Stay focused in your goals and with a little luck and good hard work, I am sure you will achieve also like me. Work hard, work smart and ask self why you need to do things this or that way BUT more importantly, is there a smarter, shorter and faster way which yields the same efficiency and effectiveness! UO taught me this! Community Work – How It Can Sting Or Bring Cheer! I have always been involved in some form of community work or other. Why do I do it? I have no clue! Maybe I just enjoy helping and seeing the fruits of a project working for the benefit of a selected group makes me happy. In total over my current life span, I ran 10 golf tournaments (of 132 pax min per tournament), 8 major fund-raising dinners (average of 1,000 pax max) and other small-scale events. My credit is SGD12 million to date for funds raised. Fund raising taught me networking, meeting and talking to different people from all walks of life. It taught me marketing and interpersonal skills. More importantly, it gave me wisdom in how to observe people. I have hung up my boots on fund-raising – call it donor fatigue or I am tired chasing after dollars for a good cause! Perhaps it is also how good corporate governance may have lacked in the past and how fund-raising may have become a negative instead of a positive. Instead, I now give time to help the community. If and when I have spare change in my pockets, I would make mindful donations. For now, my pet cause is the elders. For lack of a more creative approach, elders are called seniors, silver-haired, pioneers etc. But face it, at the end of the day, it is the elderly that is of concern without need of frills for a better branding. The elderly population in Singapore is a real concern. Soon, I will join the elders and if you carefully observe, we are surrounded by elders. A reality that Singaporeans must face. Engaging this group and keeping them active is of major concern to government and citizens. The fear of being ‘useless’ is a major concern of elders. What if dementia sets in or they end up alone. Most usually do, as many are single. I pass by a community club to work each day and I cannot help but remember a grassroots person who used to Chair this community club then. They ran a food ration pack for elderly poor on a once a month program. I gave to support the cause. I am sure many others did as when I blew the whistle for help, I further raised another SGD2,500. I did not mind helping but what saddened me was the need for me to chase down this Chair and insist that he acknowledged each donor’s contribution, regardless of how small it may be. I believed in good faith and trust and I had to account to each of my donor contacts that their funds were not misused or it went into an abyss! A good learning point is that the community club, much less the chair lacked the expertise to appreciate and cultivate donor’s network. By giving a negative impact to donor’s for their good deed, it may deter them from ever returning to give. I gave on account of the cause and the fact that I knew the Chair personally. What I did not expect was the unfortunate lack of follow-up to acknowledge or issue receipts to donors. A failure in good corporate governance and communications protocol. I owed my duty of good faith and trust to the fellow donors I approached. At the end of it all, I did not receive a word of thanks from the Chair and ended up without any receipt for self nor a thank you note. If I am not active in community work, I would not have put this past and moved on. I wish this community club well in continuing their fund-raising programs. Perhaps this Chair was not aware of this simple etiquette. But I frown, as I knew he gave SGD200 once to a charity I was helping and was told he hounded for a huge certificate and later on scoff at the charity saying it was not worthy of his help as their cause was not as magnified as another well know charity! At Whistler’s cellar door, Martin informed us that he had kept kangaroos who may have been victims of road kill. He described one kangaroo who was a wallaby in its mum’s pouch when its poor mum was ran over whilst hopping about. 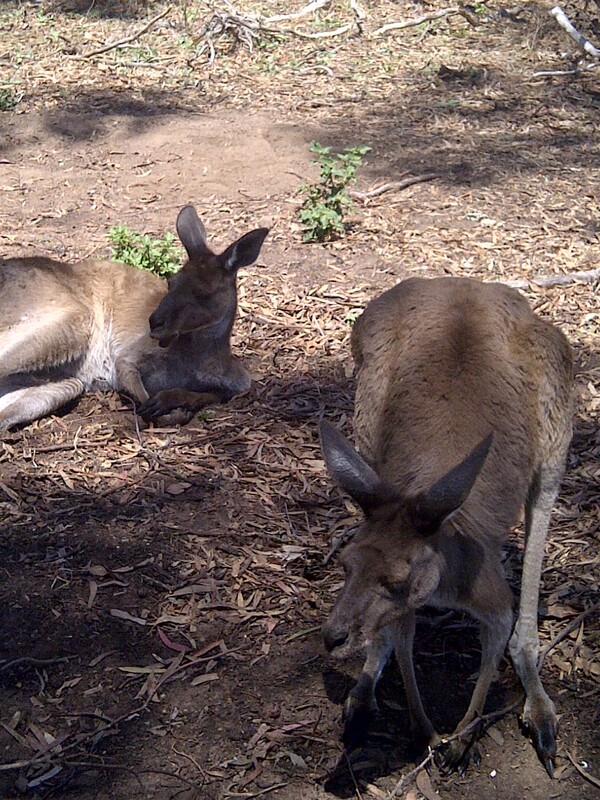 Fenced in an enclosure and fed well, these kangaroos grew up well taken care of with loads of nutritious fruits & grains. They were like pets and I could go very near them without any reaction on their part. Whilst there, I caught sight of a wild kangaroo trying to get into the enclosure…ha ha one would think captivity frightens any wild beast. OR maybe, this kangaroo was lonely and wanted to know why his friends were in there and he was not. I pet the roos (Australians use the slang word “roos” for Kangaroos) and they felt soft, quite unlike a dog’s fur, but much like a koala. They did not smell very good and there were flies or insects buzzing around them. Hmm, if I had a roo for a pet, I guess I would be showering them like a dog, making them smell fragrantly floral! I remember once when staying at Bushy Lake in Perth, I woke up early to harvest some Easter lilies and boy! I saw a roo about my height, hippity hopping away, jumping over a high wire fence without any issues. They could certainly leap high! Steve Cuddihy of Woody Pears Vineyard in Perth used to share with us how he would shoot these roos as they were pests, culling grapes off the vines, devastating his crops. He used electric fences to keep these pests out. To me, a kangaroo is an animal I would see in a zoo…but here, it was up close and personal and I learnt how pesky a kangaroo could be to farmers and yes, I was treated to kangaroo steak by Steve but I certainly did not even want to try it! Imagine, eating Skippy the bush kangaroo. It would be as bad as eating Mary’s Little Lamb! Imagine waking up and dashing off to your private jetty for a dangle on your fishing hand line to see what you land! I had this privilege at Roger’s holiday home in Kangaroo Island. 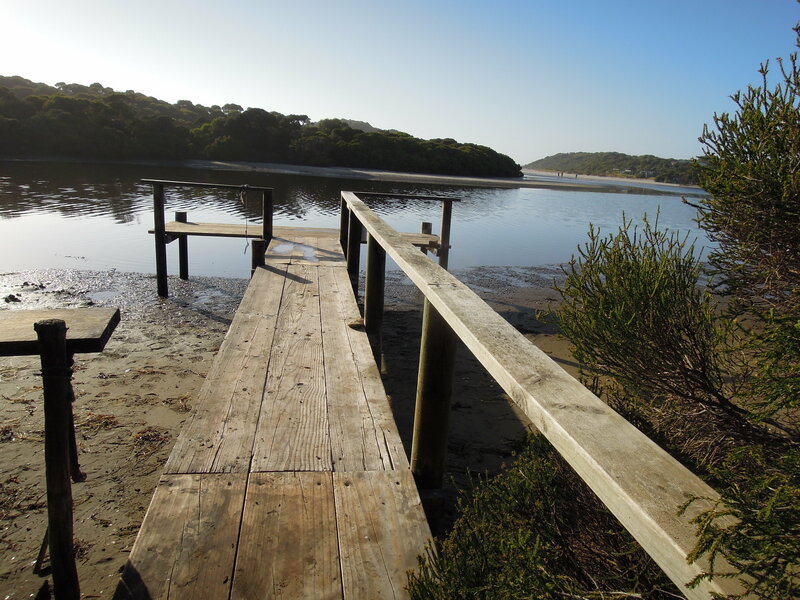 The property had a 9 hole golf course, its own private koalas (there was a pair in the Gum trees – common genre for Eucalyptus Trees), kangaroos (we call “roos”) and my favourite – its own private jetty with loads of breams or herrings, depending on the seasons you fish in. I was told when the tide is up, it can rise above jetty levels. This did not happen when we were there as it was mostly at good water level when the tide was in. Inset photo is when the tide is out. Sometimes it is not about the fishing but the tranquil environment that leaves me to think whilst I am actively supposedly fishing! Roger’s parents, Marlene and Ken, played the perfect hosts as Marlene baked fresh breads every morning whilst Ken kept us occupied with different activities the property could offer. Adelaide Beach & Why It Suits My Mood Today! I love the “call of the sea” as it is oft said in novels of mariners! I ain’t an “old salt” and neither am I a sea farer. But I am intrigued with the wonders of the sea, its marine life, bird life and what can be found on the beach. I can walk on the beach, enjoying the warm sand and crashing of waves in the back ground. The smell of the sea is also a treat as its saltiness in the sea sprays reminds me of the mighty ocean. 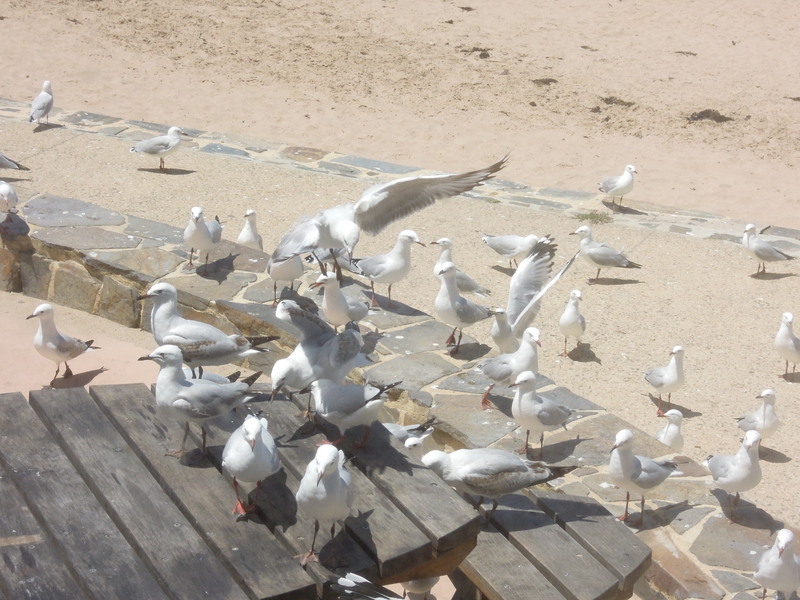 Sea gulls would caw above and in this scene depicted, these naughty fellas were waiting like scavengers to steal fish and chips from the nearby Flying Fish Café. They did a great job of stealing off a an elderly couple’s piece of fish! Happily, they took it and shared with the flock! Pests or scavengers to locals there, but to me, the occasional tourist I did not mind as it added to the sea scape. Forgiving is easier said than done. Usually one is hit with pain, loads of tears, morose, self blame for allowing it to happen before anger and hatred seeps in. I confess I do not forgive easily! Why would I since the last time I checked I was not an angel, neither was I enroute to being canonised as a saint! I have had one extremely huge set back this year and I replayed the situation a million times. Why did I allow it to happen? Why did I trust this person? Why did I let my guard down? This person has literally taken what was required, uprooted and left. How do I start to forgive this person? Where would I begin. In the first place, this person would not see self as erred but instead put blame on me – I asked for it! Hmm, I can visualise the ancient times of women beating their chests and crying to the heavens, wailing “why me” and has heavens no eyes? I am resolute against forgiving this person much less forgetting. I am determined to see how the last chapter ends. I cannot believe that one can get away with deeds unwarranted and live without remorse nor fear of retribution! It is harsh on my part but I often wish that if I was endowed with magical powers, I would teach such people of their misdeeds and reform them. It may not work as they may not agree to reformation but still, I would have tried. He can spout loads of apology without sentiments or with genuine remorse. In the similiar light, I apologise profusely to this person for allowing entry to my life. I further apologise for letting sympathy and kindness overtake my sensibility and good sense to place faith and trust in this person. Lastly I apologise to this person for letting things go further than it should in my life. I give blessings to this person to have strength and courage to admit fault to change and perhaps through the good grace of spiritual intervention, have the graciousness to apologise and seek forgiveness. As for forgetting…it is a tad hard as I have an elephant memory and unless it is wiped out, I cannot erase the hurt and pain this person has inflicted onto my life. It can be said that this person has taught me cynism, being critical and firmly say “no” to others who attempt to take advantage of my good naturedness or when I feel the urge to believe. Everybody Lies…..how troll but true Gregory House! Friendships and relationships are a rarity these days. Why? Do people whom you think you know for decades understand you to the point of what makes you tick, laugh, sad or down to your favorite foods, fruits or beverages? It would be truly great if you have a soulmate or friend who does that! To be able to know your innermost thoughts, happiness, sadness and your fears. To be supportive of your endeavours, of course not to the point of setting yourself before a fall! I often feel people clam up and create a world they want you to see them in. Not exactly honest, but perhaps the keeping up with “Joneses” syndrome is lurking. This is not helpful as it does not help in relationship building. If the person does not accept you based on your financial background or educational stature then, you are not with a friend. The handful of people I knew and whom many I have chucked, were more interested in what is in it for them by knowing me. Generosity was big if if I gave big leads or big business deals. Sometimes people would come to me for personal solutions or a shoulder to cry on. But once their issues have resolved, I hardly saw them till the next problem erupted for them. Why is sharing a life difficult? It is difficult and a challenge when you thought you knew a person over time. But the sad truth is, the person whom you thought you knew led a second life. Some can be who you want them to be so as to win your trust and gain a foot hold in your life. But do these last? If one takes away the financial stature and go back to school days, were there disparities too? You betcha! I studied in an elite school with elite background classmates that were ferried to school in limos with drivers. I did well in school there but did not go beyond primary 3 there as my parents transfered me to another mission school nearer our home which had normal students, not who’s who is the parent. It was a good move as I found the environment better and I could relate better. Sharing a life requires dedicated honesty and trust. It is not founded on arty farty glitzy lives of being dressed in finest but without a heart for anyone else. It is also not about seeking to put your name in neon lights if you do societal good or chase a PBM for grassroots work. The want to give must be right before the rites of passage to share begins. Working at a co-operative taught me humility as I mixed with employees from a lower stratum of societal wealth. Lower in educational background, poorer in wealth but extremely rich in warmth, honesty and sincerity. Lay Kuan was in her late 50s, a housewife till she came out to work to support her family income. She spoke only Teochew and bits of English and worked as a packer for the co-operative, bagging groceries, wiping down cashiers’ counters and re-packing rice into 5kg bags. Lay Kuan respected me at age 19yrs as her supervisor and went about in her usual chirpy way, always to lend me a hand to get packed lunch or in my displays of grocery items. I was in charge of non foods including pet food. I especially remembered her warmth and “motherly” care at work. She often offered me a “you tiao” for breakfast for afternoon tea depending in shift she worked that day. She worked double shifts most times for income. Jenny was another nice lady. In her 40s she lived several bus stops away from where I lived. Her husband would pick her up whenever we finished the night shift at 10.30pm and she would give me a ride home. I met my good friend here. Karen was from the National University of Singapore and was the pioneer batch of graduates that the co-operative was investing in for better educated quality management personnel. Though my meeting and working with Karen was brief as I left for my University studies, we became fast friends, working alongside developing in store promotions to drive sales up. I remember a mystery till this day as to why canned pet food flew off the shelves, chalking huge sales when we both did a promotion. Rumor has it that people who lived there thought it was canned meats. The estate was not filled with pet lovers and we were sited in the heartlands. Before this promotion, we had no little movement on pet food. Suspecting that the labels looked like stew as it had peas, carrots with meats, I felt the need to draw dogs and dog bones on the posters. More graphics and less words as maybe, the residents were illiterate and did not know they were buying dog food. I also had the agency that brought the canned food in to drape the counter with dog bowls, collars etc and a promoter to ask buyers if they had a pet dog at home. Miraculously sales dropped to less than two cartons a day, which was about right. I learnt my first lesson in sales and marketing that day. Never assume! I was happy working at this co-operative but realised that I was cut out for bigger things. For an interim job with salary starting at $350 a month rising up to $720 after 3 months was not a career choice. The people and business model were correct and it taught me the right approach in life. It is about compassion, humility and understanding people from a different stratum of society and how they strive for a better life by making selves economically viable.